This page discusses standard cement and sand grout, as well as unsanded, additive modified (latex, acrylic) and specialty grouts (epoxy). "Grout" is the term for tile work and "Mortar" is the term for masonry. They are basically the same mixtures of sand, cement, iron oxide pigment, and water. Sometimes they are mixed with additives to make the mix more plastic or impart some other feature. A "sanded" grout has enough body to use in the wider grout joints. 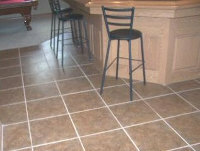 A "non-sanded" grout is used for very narrow grout joints. Manufacturers can also add epoxy, acrylic, latex, and/or other proprietary formulation ingredients designed to impart an aesthetic or performance characteristic. These are the "modified" or "enhanced" grouts. Colors can be made deeper and richer with one of our solvent based penetrating sealers. There are choices for finishing gloss - from none to high gloss depending on the sealer. Some grouts are marketed as "waterproof". The manufacturers achieve this with an additive. However, it has been our experience that the waterproofing usually does not last past one year. After that, the grout needs to be sealed. Unfortunately, the remaining waterproofing additive could make it more difficult for a new sealer to bond and any color enhancement effect could be uneven. You need to test for this. The great variety of colors allow for a wide spectrum of design options. Using smaller tile pieces (3"x3" or less) creates more grout joints and that increases traction where needed. Unless sealed with one of our acid resistant sealers, do not use cleaners containing any level of acid, even citric acid. Over time these will eat away the cement paste and change the texture and color. See Insta-Clean as a safe stain removing option. You should review the other suggested pages referenced on this page, however, most stained grout can be repaired with Grout Restoration. One of the greatest sources of stain problems with grout is because an installer or supplier might claim that grout does not need to be sealed. Simple logic says otherwise. If a surface (grout, stone, tile, etc.) will darken under a water drop, it will absorb a staining liquid. These can cause some problems if you are not aware that additives can remain behind on the surface face. Look for names and descriptions that include the words: poly, modified, latex, acrylic, polymer. If this happens, you need two stages of cleaning. First use Grout Residue Remover for removing the cement portion of the grout residue. As the polymer additives do not react with that type of formula, the second step is using lacquer thinner. If something stronger is needed - then use "Premium Stripper". Any additive residue on the surfaces must be removed completely prior to sealing to make sure it does not interfere with the new sealer. Test with water drops and compare to unsealed grout. If there is a noticeable difference, treat the situation along the guidelines found in the Problem Solving section on the page Redoing a Previously Sealed Surface! This is because any additive residue remaining in or on the surfacing is identical to the condition of some sealer left below the surface after stripping. Note: the same condition can occur from polymer type setting materials also, if the installation of the tile got to be a messy process and setting material got on the tile face. 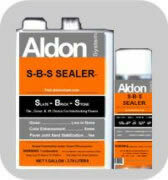 Seal the grout as soon as dry with Aldon S-B-S Sealer. This particular sealer formulation is able to bond well to a surface like this. Or test the grout every 2 months until the additives have broken down enough to allow a water drop to darken underneath. At that point the grout is able to absorb a sealer enough to get it protected properly, but test thoroughly. If absorption is uneven, it is best to choose a non-color enhancing sealer so the final color is uniform. If the tile surface will trap grout: (all but the slickest finish will do this to some degree) Do not pre-seal (seal before grouting)! Instead, prevent grout smears, surface scratching and keep grout residue out of any surface texture characteristics, prevent grout "additive" residue - by coating with Aldon Grout Easy before grouting. "Grout Easy" is a water soluble coating that comes off easily while grout is being cleaned up the normal way with water and a sponge. Grout is a cement product. Overuse of acidic cleaners can remove the top layer of cement paste and change the look to a more grainy appearance with emphasized sand particles. If it is too late and there is grout residue to be removed - use "Grout Residue Remover". The right sealer can disguise minor color problems. Although you can do some laborious calculations to determine the total square feet of grout surface, it is still a guess. It will vary greatly with width and absorbency of grout joints. Therefore, the best way is to order only a small amount of sealer and let the actual job consumption determine how much sealer is needed in total. If any portion of the grout shows even slow absorption of a water drop, it is not sufficiently sealed. With an absorbent surfacing you select the sealer according to the surfacing, not the grout. The grout will be sealed automatically in the process. With a non-absorbent tile, no matter how careful you are, some sealer will get on the tile face where you do not want it. A petroleum based sealer will need to be cleaned off the tile face with lacquer thinner. Not difficult, but another step. Same Day Sealer is water based and non-glossy. Therefore, it will wipe off the tile face immediately and easily as you proceed with the sealing process. Also, it is available in quarts with an applicator tip for grout joints. #2. If the Grout is installed, but never sealed. #3. If the Grout has had a sealer applied in the past. When sealing only the grout and not the tile, this is relatively easy to clean off the tile face (the inevitable slop over) with lacquer thinner. 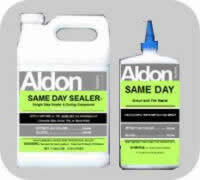 "Same Day Sealer" on grout. This sealer is Water Base | Penetrating Type. Provides: No color enhancement or gloss. Coverage guidelines (depending on absorption) 250 to 600 sq.ft./gal. Because Same Day Sealer does not create a gloss film and is water based, it is the easiest to wipe off the tile face when sealing only the grout joints. Also, the quart size with grout joint applicator tip makes the process easier and faster. Easy Care Products: for a Grout floor. "Maintain" - for no streak wet mopping of Grout and all other types of flooring. You may have heard of concerns about Grouts. All of them would be prevented with the information we provide here. Therefore, you can have the floor you want! There is no need for confusion or problems brought about by misidentification of a surface type, yet it happens all too often. Sellers use fancy marketing names that can be misleading about the true nature of a surfacing. For instance, a customer was told they bought "Petite Grout" for a bar surface. But, unlike Grout it was etching circles from wine drips. After simple testing, it proved to be a limestone which is treated very differently than Grout. It was easily restored and protected after a 60 second test. Please review our "Surface Types" page to compare pictures, descriptions, and testing if needed, to confirm you have what you were told.